Riding a historic train pulled by a steam-powered locomotive is great. But it’s even better when it’s the Durango Heritage Train, a once-a-year event that allows guests to experience an 1880s train ride on historic passenger cars filled with people in period costume: cowboys, cowgirls and high-society folk wearing the latest Victorian fashions. 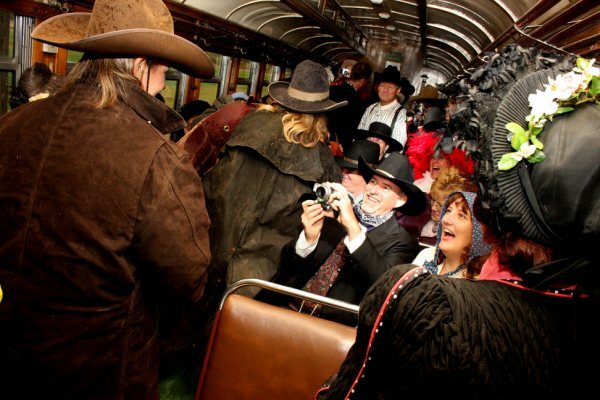 And you will be, too: Victorian or Old West costumes are required for everyone aboard the Durango Heritage Train. Before departing, passengers can also buy silver and gold “coins” to have a quick bribe on hand in case robbers do overtake the train. Passengers must be at the Durango train depot by 9 a.m. Sunday, Oct. 13, for departure at 9:30 a.m. The Heritage Train will return — hopefully without running into any robbers (wink, wink) — at 10:45 a.m. If you’re looking for a place to stay while you’re visiting Durango, you won’t feel robbed (ba dum) when you book your room with us at the Durango Quality Inn!